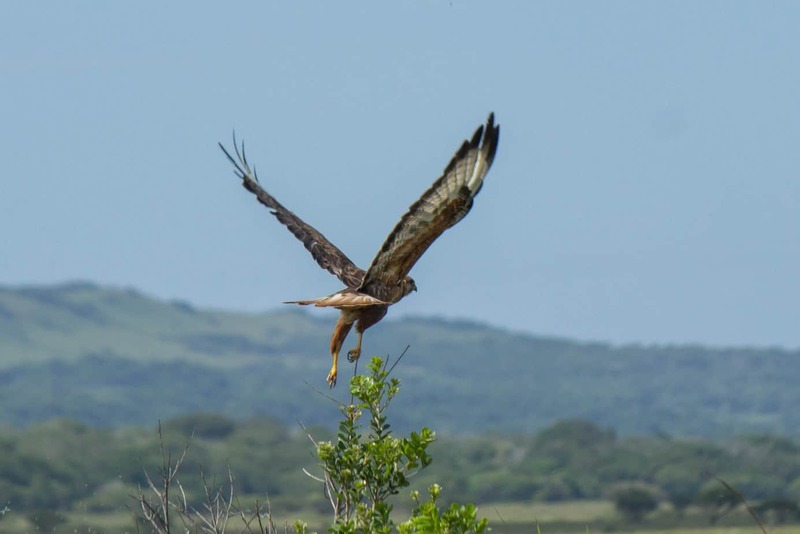 The steppe buzzard (Buteo vulpinus) is a migratory bird of prey and one of the most common species of raptor in southern Africa during the summer months. It is often considered a subspecies of the common or Eurasian buzzard (Buteo buteo), but it differs somewhat physiologically. It is smaller than the common buzzard with a length between 45-50 cm (18-20 in), but with longer wings and tail. Coloration is similar to that of the common buzzard with an overall brownish appearance, yellow legs, and darker upperparts. Like the common buzzard, the steppe buzzard also shows great variation in color with varying degrees of rufous to grey in its plumage. 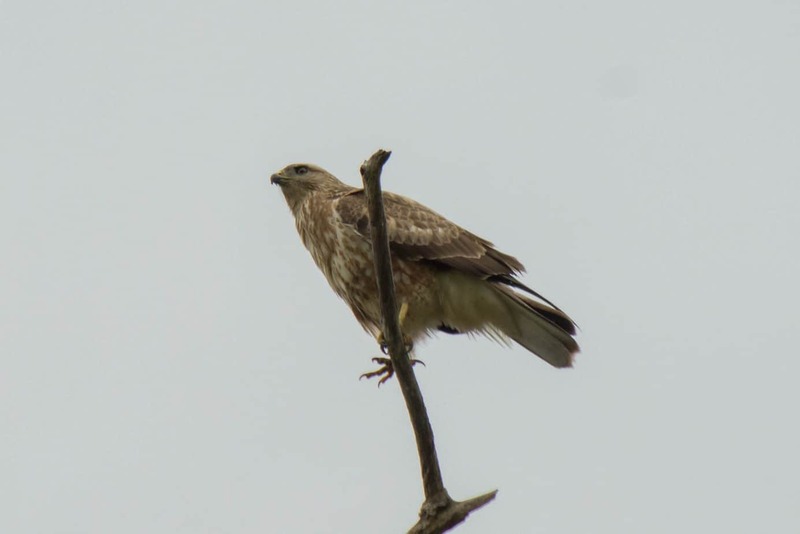 The tail feathers of the steppe buzzard is often slightly rufous in appearance whereas tail feathers of the common buzzard is generally whitish. 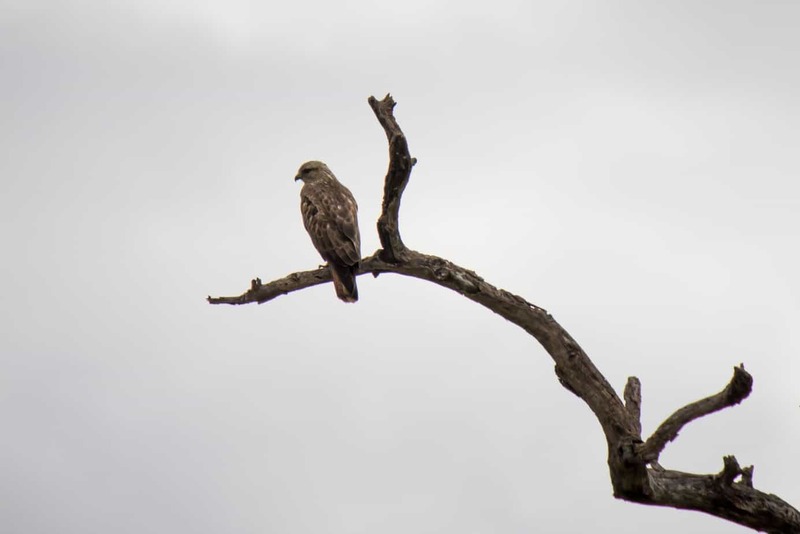 It shares some of its African range with the similar and less common resident forest buzzard (Buteo trizonatus), but forest buzzards are generally whiter on the chest and underparts, and are without the barred flanks seen on the steppe buzzard. 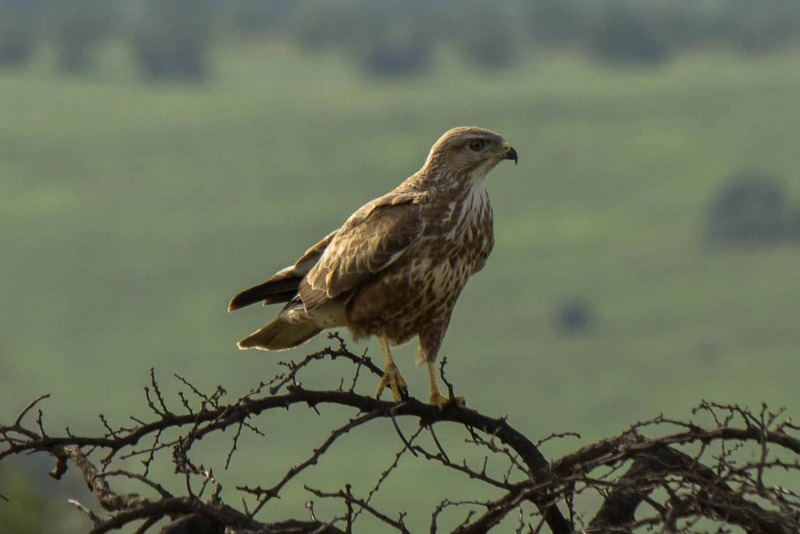 The steppe buzzard prefers open habitats, such as grasslands, savannah, farmlands, and open woodlands. It can also be found in denser forest regions. It is very common to find them perched on wooden poles, fences, and dead trees. Diet consists of insects, small mammals, birds, amphibians, reptiles, and occasionally carrion. It spots its prey when perched in the open, and will swoop down to the ground to catch it. Smaller birds and insects can be caught mid-air. 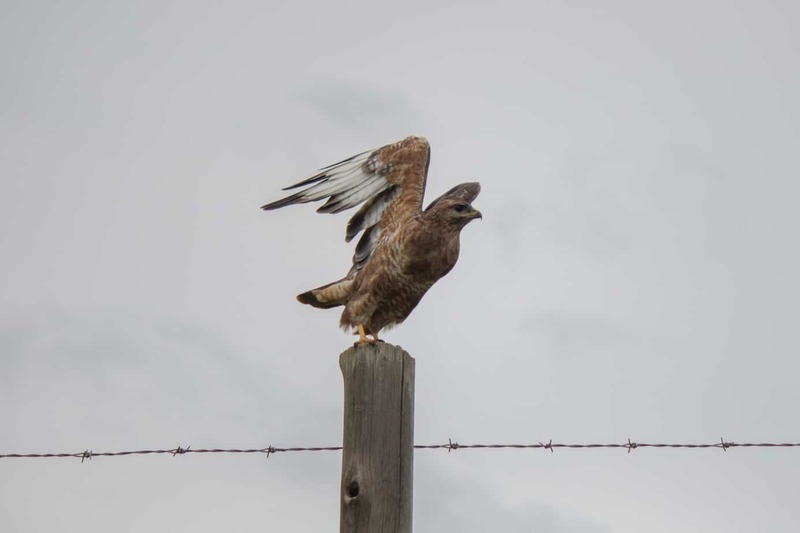 The steppe buzzard migrates over long distances. It breeds from eastern Europe to Siberia. 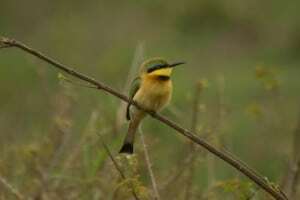 Some migrate to India during winter, whereas many migrate to East and southern Africa. It arrives in southern Africa in September, where it will stay until March, and a few as late as early April. It is generally a solitary bird or in pairs, but will form larger flocks before and during migration. It is a monogamous breeder, and stays with one partner throughout life. Nests are built high up in the canopy of trees where it is protected by branches and foliage. The female generally lays one to three eggs. 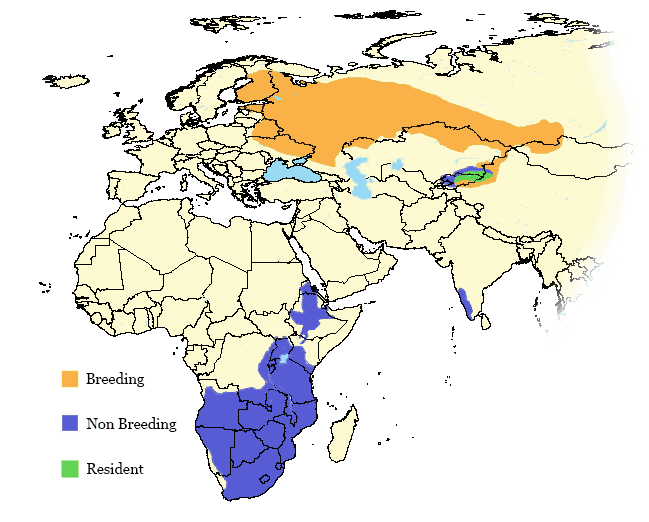 As stated, the steppe buzzard is often considered a subspecies of the common buzzard, and is not considered as one species on the IUCN Red List where the common buzzard is listed as least concern. 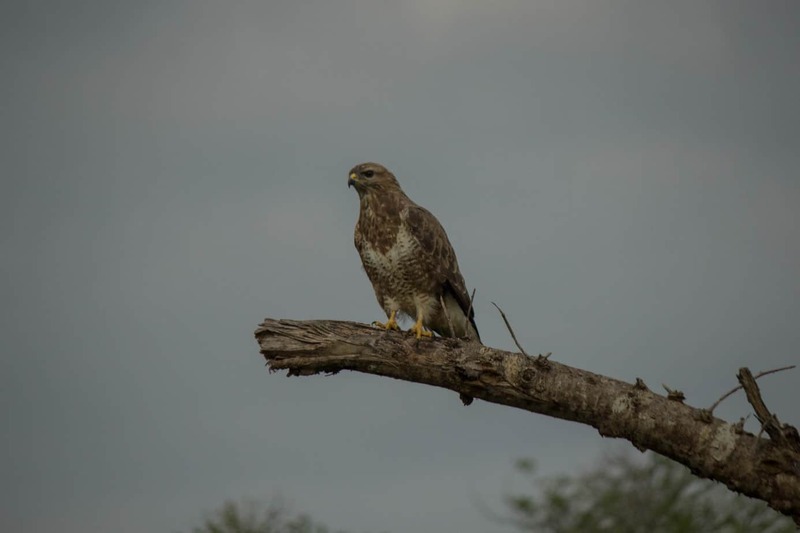 The steppe buzzard is the most common bird of prey in many parts of southern Africa during the summer months. 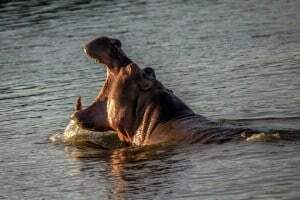 With its large range during both breeding and wintering, large numbers, and adaptability, it is reasonable to consider this species to be of least concern.